The five-month long siege of Anzio stands as one of the great fiascos of World War II. Intended to be a decisive end-run around the German defenses of the Gustav Line, the battle devolved into a siege that at times more closely resembled the trench warfare of World War 1 than the mechanized battles fought across Europe. 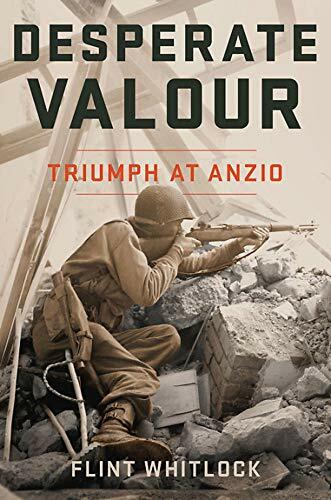 In this new volume published for the 75th anniversary of the battle in 2019, the author advocates that Anzio was in fact a great defensive victory that was won by the valor of the British and American troops that defended the beachhead. The author does a marvelous job of using diaries, letters, and other primary sources to tell the stories of the soldiers on both sides who fought and died in difficult circumstances, but his basic narrative of the book minimizes the original purpose of the operation—a quick strike into the rear of the German defensive line and perhaps a strategic thrust to capture Rome and destroy the German armies in Italy. From this perspective the operation was almost doomed from the start. The Allies only committed two reinforced divisions to the original invasion, an insufficient force to seize and hold a large salient until the anticipated Allied thrust from the south could relieve them. More importantly, the American commander of the operation, Major General John Lucas, was given vague and contradictory orders, particularly from the controversial commander of the American Fifth Army, Lieutenant General Mark Clark. Because the Germans had launched vigorous counterattacks against previous Allied landings in Sicily and Salerno, Clark warned Lucas not to “stick his neck out” and ensure his beachhead was sufficiently dug-in to resist any German counterattack. At the same time, Winston Churchill and the British commanders in Italy assumed the Anzio invaders would quickly strike into the German rear areas, hopefully making it all the way to Rome or at least cutting the main highways supplying German forces in the south. When the Allied forces stormed ashore on January 22, 1944, they had achieved complete strategic surprise, and for almost 48 hours the Germans had only a token force to resist their advance. But General Lucas, following orders and his own experience from the Salerno invasion, spent valuable time digging in and consolidating his foothold. Unfortunately, none of the Allies anticipated that German Field Marshal Albert Kesselring, the highly talented commander of German forces in Italy, could react as quickly or forcefully as he did. With their usual decisiveness, the Germans quickly assembled forces to first contain the Allied forces and then begin a series of furious counterattacks demanded by Adolf Hitler to throw the Allies back into the sea. The brutal see-saw of attack and counterattack between the combatants is well chronicled by the author who lets the soldiers tell their own stories of fear, heroism, loss, and misery as they battled both the Germans and the weather during weeks of intense combat. When the final German attack was turned back in early March, the beachhead now settled into a stalemate as both sides prepared for the inevitable Allied attack to reach the beleaguered troops and advance on Rome. The final part of the book chronicles this final Allied offensive to smash through the Gustav Line and meet the Allied forces preparing to break out of the Anzio beachhead. Although the rocky relationship between the British and American commanders in the Mediterranean Theater has been well documented, Whitlock does a good job of capturing the almost insubordinate actions of General Clark in his dash to capture Rome before the British, disregarding his orders to cut off the retreating German forces reeling back from the Allied offensive, a truly missed strategic opportunity to shorten the war in Italy. None of the Allied commanders is judged kindly by Whitlock, since it seems they spent nearly as much time haggling with each other as they did fighting the Germans. Although the Anzio beachhead is relieved and the Americans enter Rome on June 4, the glory sought be so many British and American generals of capturing the first Axis capital is quickly overshadowed two days later by the Allied landing in Normandy and Italy is relegated to a secondary theater for the rest of the war. The soldiers fighting at Anzio, Allied and German, fought under some of the most trying conditions of the Italian campaign and the bravery of these men cannot be impugned; 22 Medals of Honor were awarded to American soldiers during the five months of the campaign. But to call it a great defensive victory, while taking nothing away from these soldiers and their sacrifices, misses the objective of the entire operation—a lightning strike into the rear of the German defenses to encircle and destroy the German armies in Italy, and in that regard, it has to be judged an operational failure. The valiant stand of the Allied forces did at least prevent a significant strategic and propaganda victory for the Germans, and for that effort Whitlock rightly gives these men their due in this book.